I break down the world into abstract shapes. And I love bold colour. Whether working in paint or making prints, I am interested in layering and overlapping of tones or textures. I am inspired by old worn surfaces. On a recent trip to Marrakesh I was transfixed by the worn paint on wooden doors. A set of prints were inspired by shapes, structures and worn ropes on the quaysides of Reykjavik, Iceland. Recent abstract acrylic paintings have been inspired by the riverside Essex village of Wivenhoe. Boat shapes and the daily tidal washing of the reedbeds and wrecks, sometimes submerged, sometimes not, inform lots of my imagery. 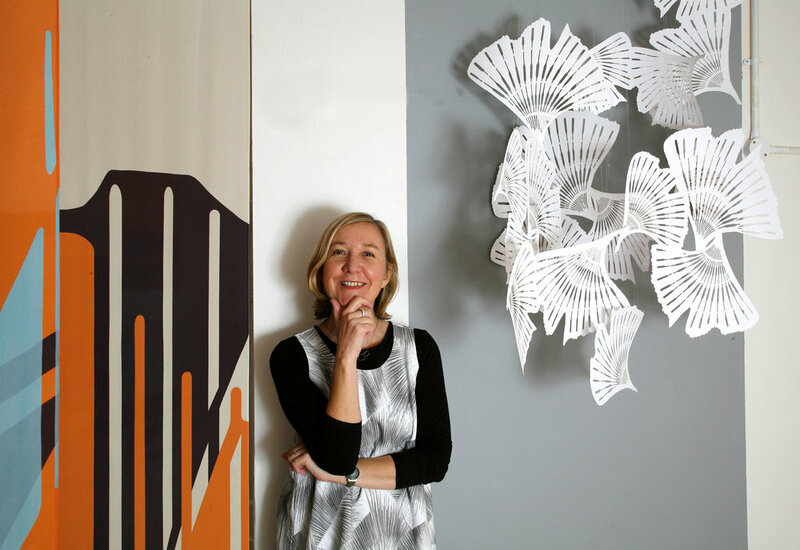 I formally trained and worked as a Graphic Designer for over 20 years, then returned to study for an MA at Central St Martins following my passions of mixed materials and textile design 2006-2008. Following my MA, I was commissioned to create a 3-dimensional patterned shade structure made from plywood for a Gold medal-winning Chelsea Flower Show garden; a laser cut window display for Louis Vuitton; a collection of contemporary wallpapers inspired by ecclesiastical embroideries; a suspended paper sculpture of laser cut Ginkgo leaves for a gallery commission. Until recently, I designed and sold my own ranges of printed textiles, ceramics and cards, featured in the Tate Modern shop. I am a member of Muswell Hill Creatives, Wivenhoe Printworks and in 2019 will be exhibiting for the first time in Crouch End Open Studios. I also sent out occasional newsletters with invitatations to shows and news, if you’d like to sign up.